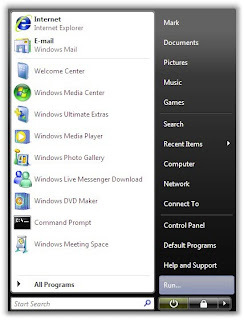 One important feature of Windows 98,2000,ME,NT and XP is its RUN command which enables users to directly type the desired location of their files or by typing the web URL in RUN dialog box.Other features includes that the RUN dialog was that it saved the history of what we had typed in. 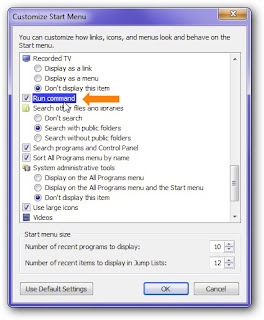 But unfortunately this feature is automatically not appeared in Windows Vista in Windows 7.I don't know why but there is a very easy and convenient method to get back that feature. Click "Properties" and then click on "customize..." when new window appears. Simply check the "Run command" and you are done.